The Crested Butte Historic District has 339 major structures, with 85 percent of them dating from the late 19th and early 20th centuries as Crested Butte emerged as a supply hub for nearby silver and gold camps and then as a coal mining town for the Colorado Fuel and Iron Co. Most of the buildings are made of wood, and many of the commercial buildings retain the false fronts popular at the time to make structures appear taller and wider than they were. The dwellings reflect simple design and are of small scale, with most of the homes narrow and single-story while the commercial buildings are one and two stories tall. Crested Butte also is notable for the variety of secondary buildings that remain intact along many of the alleys, according to the listing in the National Register of Historic Places from 1974. 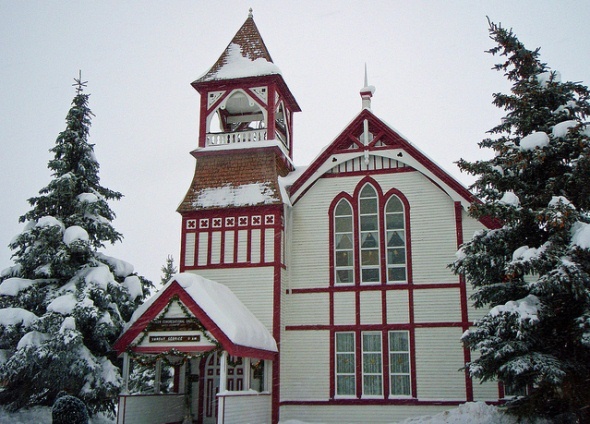 Among the significant buildings in Crested Butte are the Denver & Rio Grande Railroad Depot, the Mine Superintendent’s House, and the United Congregational Church. The depot was built in 1883, two years after the arrival of the narrow-gauge railroad from Gunnison, and served both passengers and freight. It is a wood frame structure in the Queen Anne style with the typical brown-and-tan features. The depot closed in 1954 as the railroad pulled out its tracks following the 1952 closure of the Big Mine coal operation by the Colorado Fuel and Iron Co. It’s at Seventh Street and Elk Avenue. The two-story, Victorian-style superintendent’s house was built in 1883 to serve the superintendent of the CF&I’s Big Mine and his family. It was originally located on Big Mine Hill but was relocated to town after the mine closed in 1952. CF&I built similar homes for other mine superintendents, which typically were the most substantial and architecturally sophisticated homes in town. This one is at Gothic Road and Elk Avenue. The church was built in 1883, with beams hand-hewn on the site. The belfry was not finished until after 1890, and the bell was brought from a church in the deserted mining camp of Irwin in 1917 to replace one that cracked. There were no pews until 1962. The church is located at Fourth Street and Maroon Avenue.